BELTRONICS Inc, a manufacturer of industry leading radar and laser detectors, has announced the radar detector industry’s first ever camouflaged skin on its Vector 955c, Special Edition Camo Series radar and laser detector. “The new BELTRONICS Vector 955c, Camo unit, is our first ever radar detector dressed in a very extraordinary, custom camouflage finish,” said Don Rich, BELTRONICS Vice-president of Sales. BELTRONICS Inc, maker of the world’s best performing radar and laser detectors, has produced another industry first—the new Special Edition Vector 955c Camo radar and laser detector. The new Special Edition Vector 955 Camo design features a completely new, custom case wrapped in traditional hunters camouflage. The Vector Camo unit is draped in patterns typical of what most customers are accustomed to seeing in ‘camoflouge’—a pattern of irregular splotches and patches mainly in olive, black and forest green. “The new BELTRONICS Vector 955c, Camo unit, is our first ever radar detector dressed in a very extraordinary, custom camouflage finish,” said Don Rich, BELTRONICS Vice-president of Sales. “We took our industry leading detector design, the under $200 Vector 955, and created this special edition for the outdoor enthusaist,” he added. The Special Edition Vector 955 Camo has the identical feature set as the best selling BELTRONICS Vector 955 and retails for $199.95. The new V995c Special Edition model is exclusive in that it boasts a camo, or camouflaged, housing with a matching travel case. “We think that the Special Edition Vector 955 Camo radar detector with its custom camouflaged cover is the perfect gift for the outdoor enthusiast,” said Dave Smidebush, BELTRONICS Vice-president of Marketing. “The V955c, like the original Vector Series V955, provides industry leading long-range performance in attractive styling at an affordable price,” he added. With industry proven ‘best radar performance’ under $200, the Special Edition Vector 955 Camo is equipped with features found on more expensive radar detectors such as multiple brightness display settings, user selectable preference settings and Digital Signal Processing. And now the Vector 955 Camo includes the custom camouflage design. The release of the new Special Edition Vector 955 Camo unit also coincides with the BELTRONICS Rock & Rule Event which is focusing on expanding consumer awareness by featuring BELTRONICS class leading radar detectors in educational marketing communications. BELTRONICS is featuring their premium windshield mount models including the Vector 995 Camo. The BELTRONICS Rock & Rule Event is now active and runs through August 15th. “Our coordinated national marketing campaign is having maximum impact as we promote BELTRONICS products during this key summer vacation driving season,” said Smidebush. BELTRONICS and its retail partners are using print, online, direct mail and point of sale advertising to communicate this limited time offer. During the Rock & Rule event, BELTRONICS and participating retailers are offering for the first time ever, a free accessory package consisting of BELTRONICS new amazing SuperCup windshield mount and a newly designed accessory SmartCord (combination straight and coiled cord), a $50 retail value. BELTRONICS is also continuing to offer the very popular Test Drive program where customers can test drive new BELTRONICS radar detectors for up to 30 days risk free. And another first—BELTRONICS is concurrently offering its detector trade-in program along with the Rock & Rule promotion. 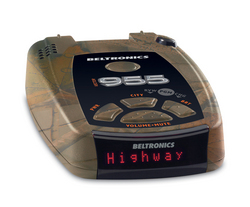 For more information on the BELTRONICS Vector Special Edition Vector 955 Camo Radar and Laser Detector, or the BELTRONICS Rock & Rule Event and other BELTRONICS products, call 1.877.GET.1.BEL (1.877.438.1235) or visit online at BELTRONICS.com.